Home › Accell B086B-008B-2 Ultraav Mini Displayport 1.1 To Hdmi 1.4 Active Adapter -..
Accell B086B-008B-2 Ultraav Mini Displayport 1.1 To Hdmi 1.4 Active Adapter -..
Accell Mini DisplayPort to HDMI Adapter provides an output when plugged into a Dual-mode Mini DisplayPort video output. This adapter is tested to be 100% DisplayPort compliant and is certified by VESA (DisplayPort). 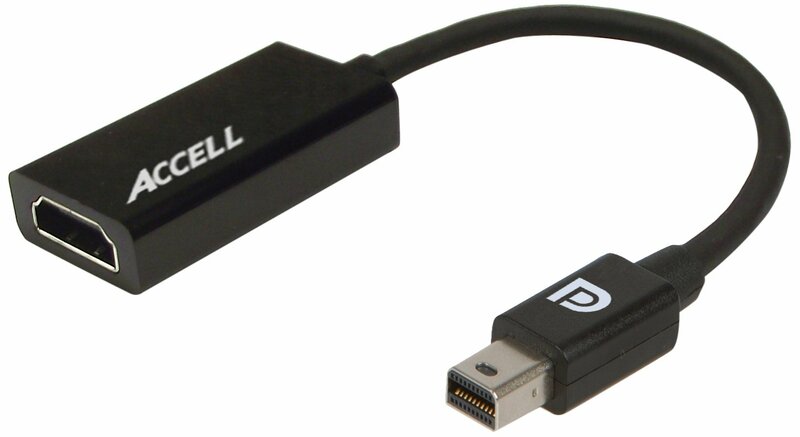 Accell is a licensed DisplayPort adopter. The Accell UltraAV Mini DisplayPort to HDMI Active adapter is AMD Eyefinity certified, providing optimal experience when using AMD Eyefinity Technology and allowing 3 monitor configuration. This validation is awarded only to those products that have undergone extensive synthetic and real-world testing. Fully compatible with a Thunderbolt port.